Buffalo Wild Wings is a typical wing restaurant that offers chicken wings in a variety of flavors, in addition to side orders such as fries, potato wedges and fried mozzarella sticks. The restaurant also offers burgers, sandwiches, shrimp, ribs and desserts. A glance at the menu at Buffalo Wild Wings will show that healthy options are few, but a few options are healthier. Appetizers can ruin your meal before your entree even arrives, because many of them contain too many calories and too much fat. Many appetizers at Buffalo Wild Wings fall in the unhealthy category, including the ultimate nachos with 960 calories and 52 g of fat, and the queso chili fries with 862 calories and 40 g of fat. The tortilla chips with two types of salsa is a lower-fat and -calorie choice, as is the grilled chicken quesadilla, with 200 calories and a little more than 8 g of fat per serving. Order the quesadilla with half the cheese to reduce fat and calories even more. While the vegetables in a salad provide fiber, vitamin A and potassium, it is important to pay close attention to the toppers and dressings. They can add an unhealthy amount of fat, salt and calories. Pass on salads that include fried meats, like the Chicken Tender Salad. The chicken alone has 170 calories and 11 g of fat per tender. Opt for the Grilled Blackened Chicken Salad, which is served on a bed of fresh greens and has only 320 calories and 8 g of fat. Order your salad with dressing on the side. Buffalo Wild Wings offers fat-free ranch, light French, light balsamic and light Asian sesame dressings. Each wing at Buffalo Wild Wings contains 72 calories and 5 g of fat. 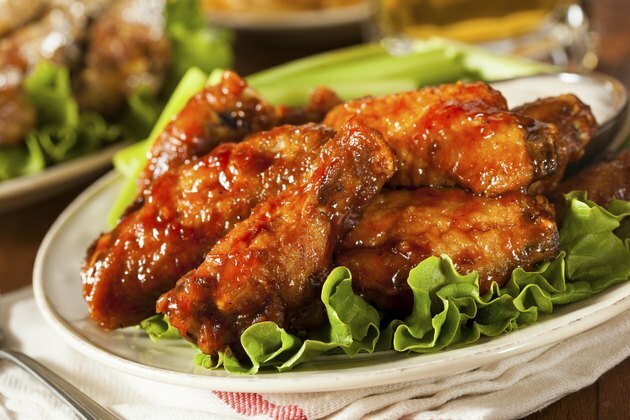 The boneless wings contain 150 calories and 10 g of fat in each three-piece serving. Your healthiest meat option is the chicken sandwich. Order it grilled with a side of carrots and celery to replace the fries for 470 calories and 7 g of fat. The sandwich also comes with lettuce, tomato and onion, which increases the nutritional value slightly. Another healthy option is the Naked Tenders, pieces of grilled chicken with sauce that contain 43 calories and 2 g of fat per tender. Among the most popular side orders at Buffalo Wild Wings are the french fries, with 280 calories and 10 g of fat, and onion rings, 460 calories and 26 g of fat. Pass on any of the fried sides, because they are also high in fat and salt. Your healthiest bet is the veggie boat, a side of fresh carrots and celery with fat-free ranch dressing. These vegetables are high in fiber, vitamin A and potassium, and contain just a few calories per serving. A side salad with fat-free ranch is another choice that provides vitamins and minerals, with about 250 calories and 11 g of fat.